As our 2016 year-end review series continues, statisticians A Lennart Julin and Mirko Jalava look back on the best jumps performances of the year. Gianmarco Tamberi was the top jumper of the 2016 season until he was struck by injury in Monaco in July. The Italian was in top form from his first indoor competition where he cleared a world-leading national record of 2.35m in Banská Bystrica in February. He improved to 2.38m in Hustopeče during an indoor campaign which included 2.36m victories at the Italian Indoor Championships and IAAF World Indoor Championships Portland 2016. Outdoors, the 24-year-old topped 2.36m to win the national title in Rieti and 2.32m for the European title in Amsterdam. He then produced a magnificent 2.39m national record in Monaco before raising the bar to 2.41m, the height at which he tore the ligaments in his left ankle. The injury required surgery, which ruled Tamberi out of the Olympic Games. Without the Italian, Mutaz Essa Barshim of Qatar arrived in Rio as the favourite off the back of his world-leading 2.40m in Opole in June. The 25-year-old performed well in the Olympic final, clearing all of his heights until 2.36m on his first attempt. In the end, though, the winner was not a big surprise. Canadian Derek Drouin had showed the world that he is a great competitor by winning the world title in 2015. He was again in top form in Rio where a first-time clearance at 2.38m, equalling his season’s best from Eberstadt in July, was enough for the Olympic title. 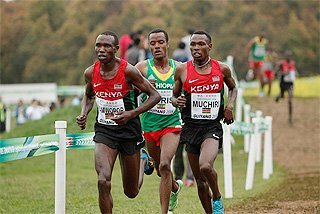 The 26-year-old has now earned medals at four consecutive global championships, beginning with his bronze medal at the London 2012 Olympic Games. France's 2012 Olympic champion Renaud Lavillenie went to Rio in good form and riding the wave of a solid season, with only a few hiccups on the way. The 30-year-old enjoyed a terrific indoor season, clearing six metres in three competitions: 6.02m in Clermont-Ferrand in February, 6.03m in Jablonec in March, and 6.02m to win the world indoor crown in Portland. World champion Shawn Barber also started his season well, with a 6.00m win in Reno in January, but didn’t manage to find consistency and didn’t reach a podium. The 22-year-old was close indoors, finishing fourth in Portland at 5.75m, but struggled outdoors. Eventually he was a distant 10th in Rio with a 5.50m leap. Sam Kendricks of the US enjoyed a fine season and earned two medals; a silver in Portland was accompanied by a bronze in Rio. 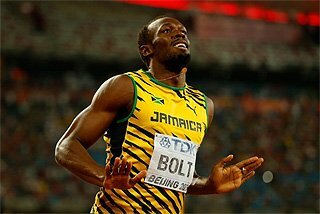 He topped a career best of 5.92m in two meetings, in Beijing in May and Lausanne in August. There was a big shock in the Olympic final as Thiago Braz, helped by his home crowd, surprised everyone by winning the title with a 6.03m South American record. It was not completely out of the blue; he had jumped 5.93m indoors in Berlin (before fading to 10th place in Portland with 5.55m) and 5.90m outdoors in his last meeting before Rio in Italy. He had also attempted 6.00m a few times throughout the year. Still, the performance by 22-year-old Brazilian in Rio was extraordinary. After first-time clearances at 5.93m and 5.98m, Lavillenie could have been forgiven for thinking that he had the title in the bag. Braz stayed alive with a 5.93m national record clearance on his second try and decided to pass at 5.98m. He then flew over the bar on his second attempt at 6.03m, while Lavillenie couldn’t respond, giving the Brazilian an unprecedented Olympic title on his home turf. Jeffrey Henderson arrived in Beijing as one of the biggest favourites for the world title last year, but faded to ninth. 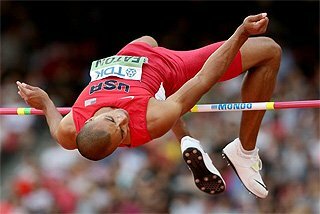 This year the 27-year-old US athlete had more experience and encountered no problems making it to the last three rounds in Rio, having equalled his season’s best of 8.20m from the qualification with his first jump. Henderson won the US Trials with a wind-assisted 8.59m, but the world leader was Jarrion Lawson, who leaped a wind-legal 8.58m to finish second at that competition. The 22-year-old competed at his first major championships in Rio and held the bronze medal position with 8.25m until the last round before Henderson swept to the title with an 8.38m jump, pushing his teammate to fourth place. Despite having jumped 8.30m at high altitude in Pretoria in March, South African Luvo Manyonga was not considered a favourite in Rio. The 25-year-old placed fifth at the 2011 World Championships, but that was his only major championship appearance before the 2016 Olympics. He qualified to the final rather easily with an 8.12m jump, and took the lead in the fourth round with 8.28m. He went further still with an 8.37m personal best, enough for surprise silver. Manyonga jumped even further in Brussels, winning the IAAF Diamond League final with an 8.48m personal best. World champion Greg Rutherford of Great Britain was third in Rio with 8.29m, adding another medal to his resumé. There was only one favourite in the men’s triple jump during the 2016 season: world and Olympic champion Christian Taylor. The 26-year-old went big early, winning Eugene’s Prefontaine Classic with a world lead of 17.76m. His only loss of the season, in eight finals, came at the US Trials. 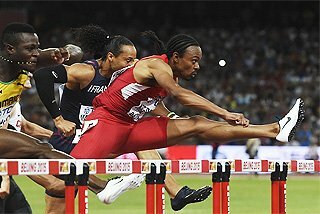 Later victories – 17.59m in Stockholm and a world-leading 17.78m in London, his last competition before Rio – ensured that the Olympic final was going to be a good one. Taylor’s opener, a world-leading 17.86m, was enough for the gold, but 25-year-old Will Claye, the only athlete to defeat Taylor in 2016, wasn’t too far back with a first-round leap of 17.76m, a personal best to secure his second successive Olympic silver. The bronze medal was clear after the first round too, with China's Dong Bin adding 20 centimetres to his outdoor PB with 17.58m, just one centimetre shy of the Asian record. 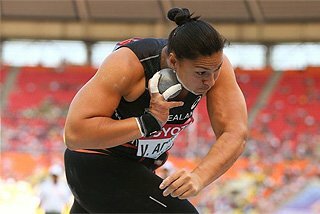 The 28-year-old, who won the world indoor title, had broken the Asian indoor record earlier in the year with 17.41m. 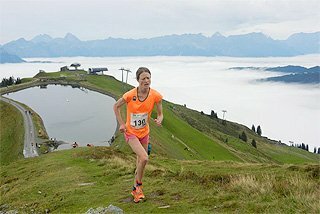 Heading into the Olympics, only eight of the entrants had cleared 1.97m or better outdoors and just one of them had topped it more than once: 37-year-old Ruth Beitia, who had cleared 1.98m twice, first when taking the European title and then when winning at the IAAF Diamond League meeting in London. 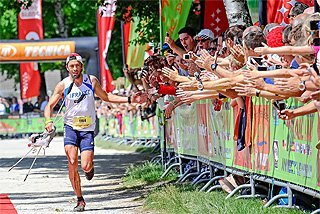 Rio marked Beitia’s 20th appearance, indoors and outdoors, at a global championship. And finally she struck gold. She produced almost a perfect summer, winning not only the Olympic and European titles but also five IAAF Diamond League competitions – and that despite not adding to her career total of 15 competitions at 2.00m or higher. Somewhat paradoxically, Beitia’s 1.97m clearance was not even the best high jump performance in Rio. That came a few days earlier in the heptathlon where both Nafissatou Thiam and Katarina Johnson-Thompson cleared 1.98m. Indoors, 18-year-old Vashti Cunningham looked very much the future of the event after raising world U20 record to 1.99m and taking the world indoor title on countback over Beitia. However, the youngster didn’t quite reach the same form outdoors and had to be content with reaching the final in Rio. But time is very much on Cunningham’s side as she is half Beitia’s age. Last year Blanka Vlasic had just two meetings before the IAAF World Championships but still managed to clear 2.01m for silver in Beijing. Her 2016 summer season was even shorter as it both began and ended at the Olympics. But as in 2015, Vlasic matched the winning height and came away with a medal, this time bronze. While the high jump is somewhat sub-par at the moment, the same cannot be said for the pole vault. Indeed, 2016 was at every level by far the best year ever. Long considered a 'new' event, the women's pole vault appeared to reach the plateau of maturity some 10 years ago. But in 2016, 10 women cleared 4.80m – double the number from the year before – and 19 surpassed 4.70m. With reigning Olympic champion Jenn Suhr hampered by illness, the outstanding vaulters of the summer of 2016 were Sandi Morris of the US and Ekaterini Stefanidi of Greece. The latter took the Olympic title on countback while Morris moved up to second on the world outdoor all-time list when she scaled 5.00m at the IAAF Diamond League final in Brussels. 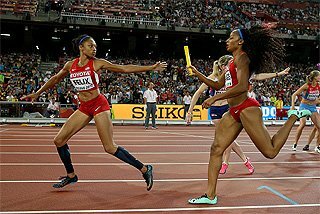 Statistically they were quite evenly matched: they came into 2016 with 4.76m/4.77m PBs and in 2016 they topped 4.80m or better three times (Morris) and twice (Stefanidi) indoors, and six times (both) outdoors. However, even though 2016 was such an outstanding year, it is quite likely that it will get even better in upcoming years. Notably, seven of the top 10 U20 vaulters of all time recorded those marks in 2015 or 2016. Eliza McCartney, not yet 20, has already joined the senior elite after taking bronze at the Olympics and finishing fifth at the World Indoor Championships. During an outdoor season where she visited 10 different nations on four continents to compete in 11 outdoor competitions, Ivana Spanovic probably set a record for consistency. Despite variations in the weather, all 13 (including qualifying rounds) of Spanovic's competitions were within 18 centimetres of one another as she leaped between 6.83m and 7.10m. She won eight of her 11 finals, was second twice and third once. Spanovic won five of the IAAF Diamond League competitions and finished second to seven-time global champion Brittney Reese in the other two. Reese produced a summer that was nearly as impressive, jumping a world-leading 7.31m at the US Trials. Despite performing brilliantly in Rio with respective leaps of 7.15m and 7.08m, Reese and Spanovic had to be content with silver and bronze. The Olympic title instead went to Tianna Bartoletta. As was the case at the 2015 World Championships, Bartoletta raised her game when it mattered most and triumphed with a lifetime best. 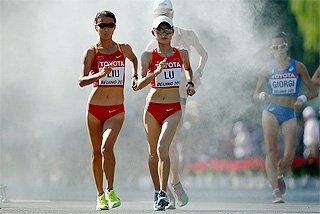 Taking full advantage of her superior speed, the 31-year-old added three centimetres to the PB she had set in Beijing one year earlier, leaping 7.17m. Only one other jumper got into seven-metre territory this year but Sosthene Moguenara had nothing to back up her 7.16m leap from June. Her second best was 42 centimetres shorter and in the Olympics she had to settle for 10th with 6.61m. In Rio fellow German Malaika Mihambo (6.95m) was the only other jumper to come within a quarter of a metre of the medallists. The most remarkable thing in the women's triple jump this year was that Caterine Ibargüen lost a competition. After being undefeated since the 2012 Olympics, the Colombian's winning streak was by far the longest in current world athletics and was certainly not due to her shying away from tough competition. 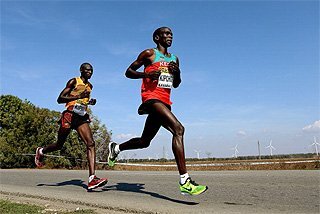 During that period, Ibargüen entered and won 35 competitions, including two World Championships and 21 straight IAAF Diamond League events. Her streak finally came to an end at the IAAF Diamond League meeting in Birmingham on 5 June when 2012 Olympic champion Olga Rypakova edged Ibarguen by five centimetres in the final round. 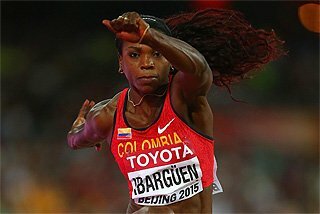 That loss, however, was not a sign that Ibargüen was beginning to lose her grip on the event. At the Olympics she effectively killed off the opposition with a 15.03m leap in the second round before improving to 15.17m in the fourth. 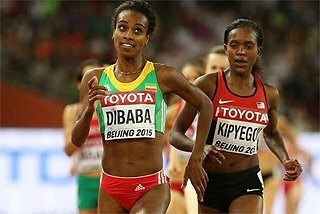 She also won the three remaining IAAF Diamond League competitions by margins ranging between 23 and 32 centimetres. Still, Ibargüen will find it hard to once again build as impressive a winning streak. Yulimar Rojas and Keturah Orji emerged as two new kids on the block with exciting potential to revitalise an event that, besides Ibargüen’s heroics, has been somewhat in the doldrums recently. In 2016, Rojas became the youngest woman ever to surpass 15 metres by jumping 15.02m, an 82-centimetre improvement on her best before this year. Orji, meanwhile, added 56 centimetres to her pre-2016 best by setting a US record of 14.71m. Still only 20 – more than 10 years younger than Ibargüen – the youngsters finished second and fourth at the Olympics.